Although a nostril piercing may be one of the most traditional body piercings, dating back centuries, that doesn’t mean it’s boring. 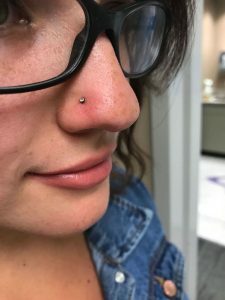 There are still plenty of opportunities to get creative with a nostril piercing, whether that means choosing a specific placement for the piercing or selecting unique jewelry that fits your style. What Are the Different Types of Nostril Piercings? Almost Famous Body Piercing offers two types of nostril piercings: standard and high. A standard piercing is located at the area of your nose where your nostril curves away from your cheek and can be placed on either side of your nose. There is usually room for two or three piercings in this area if you choose to do multiples. A high nostril piercing is a more modern version and offers the ability to layer your nose piercings for an interesting look. The location of a high piercing is, as the name suggests, higher on the nose than a traditional nostril piercing. How Much Healing Time is Expecting for a Nostril Piercing? For full healing, you can expect anywhere from six months to one year or longer. Keep in mind that everyone’s body is different, to you may find that you take more or less time to heal completely. Piercings heal in a peak and valley pattern. One day, your piercing seems completely healed, and the next day it can be sore and red. Following the proper aftercare steps will help ensure that you have the smoothest healing process possible. If you forget to do your aftercare for a few days, that’s ok! Just go back to your routine as soon as possible. 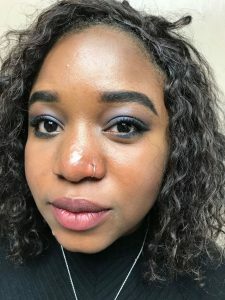 What Should I Know About Nostril Piercing Aftercare? One of the most important things to keep in mind is that you want to avoid touching your piercing unless you have washed your hands – introducing germs into the open piercing can cause inflammation, or worse yet, infection. Don’t play with or twist your jewelry, not even to break up dried fluid – instead, use a cotton ball that has been dipped in warm sea salt solution. Avoid using oils, creams, or balms on the piercing, as this can lead to unnecessary irritation. If you notice severe swelling, itching, or a rash you will want to get in touch with your piercing professional. You may be experiencing an allergic reaction to a material in the jewelry, which can be solved with a simple switch to a different metal. Signs of infection, such as fever, green or bloody drainage, the area around the piercing is red, hot, and painful, should be treated by a doctor. What are the Biggest Nostril Piercing Trends? Thanks to social media, the level of creativity in body piercing has bloomed, with trends shifting at an incredible speed. For some time, it seemed like perhaps nostril piercings were fading out of style, but they are now back – and it certainly seems that they are here to stay. Current trends involve selecting unique nostril piercing jewelry full of personality and switching up the jewelry to suit your mood or outfit. And of course, expressing yourself through your piercing will always be the epitome of style.